To a disturbing degree, Modern Man has become blinded by science. In a few generations technological advances have dramatically changed how humans live. Today, Man in the developed world lives with sensory overload: media (movies, television, internet, video games, music) and ever-advancing technology (computers, smartphones, gadgets). Men have become fascinated with shiny things, myopic with short attention spans, idolizing the material. This modern myopia has resulted in the loss of a sense of the Divine. One clear example of modern myopia is pervasive use of the word ‘awesome’. The mundane or trivial is routinely labeled as ‘awesome’. But when everything becomes ‘awesome’, nothing is ‘awesome’. The First Commandment declares that only God is to be worshiped and warns against worshiping false idols; becoming blinded by material things and using sacred words to describe the mundane is a form of idolatry. “Idolatry consists in divinizing what is not God” (CCC 2113). The word awe comes from the Greek, akhos meaning ‘pain, grief’ and ‘dread mixed with veneration’. The word awesome means ‘profoundly reverential’. Words related to awesome include: amaze (‘overwhelming wonder’ and ‘mental stupefaction’); astound (‘to stun’); astonish (from the Latin, tonare meaning ‘to thunder’ and ‘thunderstruck’); marvel (from the Latin, mirabilia, meaning (‘strange and wonderful things’); and worship (‘Adoration and honor given to God’ – CCC 2096, 2097). The Gentiles are awed by Jesus – The wise men travel great distances from the East and when they saw Jesus, “they fell down and worshiped Him” (Matt 2:11). When Jesus drives the demons from the fearsome possessed men into a herd of pigs that perishes in the sea, “all the city came out…and begged Him to leave their neighborhood” (Matt 8:28-34; Mark 5:1-17; Luke 8:26-37). When Jesus heals the sick in Tyre and Sidon, “the throng wondered, when they saw the dumb speaking, the maimed whole, the lame walking, and the blind seeing; and they glorified the God of Israel” (Matt 15:31). Jesus awes His enemies – Herod the Great was “troubled” by the birth of Jesus (Matt 2:3). Jesus commands Satan: “Be gone Satan!” and “the devil left Him.” (Matt 4:10-11). The mob that seeks to kill the adulterous woman, drop their stones and disperse in fear and shame at Jesus’ word (Luke 8:1-11). The Pharisees are “astonished” (Luke 11: 38; (Mark 7:1-5), were “amazed“(Matt 22:22) and “marvel” at Him (Mark 12:17). The Jewish leadership “feared” Jesus (Mark 11:18) because “all the multitude were astonished at His teaching.” The Sadducees “no longer dared to ask Him any question” (Mark 12:18; Luke 20:27). The Chief priest and scribes “feared Him, because all the multitude was astonished at his teaching.” (Mark 11:18). Pilate was “afraid” (John 19:8) and “wondered greatly” (Matt 27:14) and his wife “suffered much over Him” (Matt 27:19). Jesus’ exclamation of “I AM” caused several hundred men (Roman troops and temple guards) “to draw back and fall to the ground”(John 18: 3-6). The Roman soldiers who witnessed Jesus’ death “were filled with awe, and said, “Truly this was the Son of God!” (Matt 27:54). The Disciples are awed by Jesus – Joseph and Mary “were astonished” when they found the 12-year old Jesus in the temple (Luke 2:48-49). Simeon called Him God’s “salvation” (Luke 2:25-35). The prophetess Anna, saw the baby Jesus and gave thanks to God, calling Jesus “the redemption of Jerusalem” (Luke 2:36-38). John the Baptist, who Jesus calls the greatest among men (cf. Matt 11:11) does not feel worthy to “carry the sandals” of Jesus (Matt 3: 11). The Disciples leave their professions and families and immediately follow Him (Mark 1:17; Luke 5:27). Nathaniel exclaims, “Rabbi, you are the Son of God! You are the King of Israel!” Peter kneels before Jesus, “afraid” (Luke 5:8-10). Jesus causes a miraculous catch of fish and Peter “was astonished, and all with him.” (Luke 5:9). Nicodemus “marvels” at His teaching (John 3:7). The sinful woman quietly crawls to Jesus, “weeping…[and] wet His feet with her tears” (Luke 7:36-50). Jesus calms the storm and the disciples were “afraid” and “filled with awe” (Matt 8:18, 23-27; Mark 4:35-41; Luke 13:18-19). When the disciples hear Jesus’ teachings about sacrifice and heaven to the rich young man, they “were amazed at his words” and “exceedingly astonished” and “afraid” (Mark 10:24,32; Matt 19:25. When Jesus walks on the water during a raging storm, the disciples “were terrified” and “utterly astounded” and they “worshiped Him, saying, ‘Truly, you are the Son of God.’” (Matt 14:22-33; Mark 6:45-52; John 6:15-21). After feeding the 5000, Peter tells Jesus that, “You are the Christ, the Son of the living God.” (Matt 16:16; Mark 8:29; Luke 9:20). 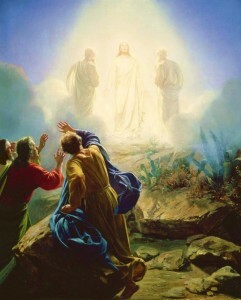 When Jesus is transfigured on the mountain, the disciples “fell on their faces, and were filled with awe” (Matt 17:6) and “were exceedingly afraid” (Mark 9:6; Luke 9:34). When Mary Magdalene and the other Mary see Jesus after the resurrection, they fall at His feet and worshiped Him and “were afraid”(Matt 28:1-10). When Jesus appears to the disciples, they were “startled and frightened” and “disbelieved in joy” and “wondered” (Luke 24:36-41). When the eleven disciples met Jesus in Galilee after the Resurrection, “they worshipped Him.” (Matt 28:16-17). Saul, a fanatical Pharisee and a key persecutor of Jesus’ disciples, is knocked to the ground and blinded by a light from heaven and is converted by Christ and eventually becomes Saint Paul (Acts 9:1-19). The People are Awed by Jesus – The Shepherds are “afraid” and then “glorified and praised God” after seeing the Christ Child (Luke 2:8-20). All who heard the twelve-year old Jesus in the Temple “were amazed at his understanding and his answers.” (Luke 2:47). The crowds respond to Jesus: “were astonished at His teachings, for he taught them as one who had authority, and not as their scribes.” (Matt 7:29); “were all amazed” and “astonished at His teaching, for his word was with authority” (Mark 1:23-28; Luke 4:33-37); “amazement seized them all, and they glorified God and were filled with awe, saying, “We have seen strange things today.” (Mark 1: 23; Luke 5:26); “The Prophet who has come into the world” and seek “to take Him by force to make Him king” (Matt 14:13-21; Mark 6:30-44; Luke 9:10-17; Mark 6:30-44; John 6:5-13); “all were astonished at the majesty of God…and marveling” (Luke 9:43; Matt 17:22-23; Mark 9:30-32); marvel at Jesus, saying “How is it that this man has learning, when he has never studied?” (John 7:15); “Fear seized them all” and “they glorified God” (Luke 7:11); she“came in fear and trembling and fell down before him.” (Mark 5:33; Luke 8:47); “marveled, saying, ‘Never was anything like this seen in Israel.’” (Matt 9:33, Luke 11:14); “were astonished, and said, ‘Where did this man get this wisdom and these mighty works?’” (Matt 13:54); “were immediately overcome with amazement” (Mark 5:42; Luke 8:56); “were afraid and they glorified God, who had given such authority to men.” (Matt 9:1-8; Mark 2:1-12; Luke 5:17-26); “were astonished beyond measure” (Mark 7:37); “were greatly amazed” (Mark 5:42).